There are two aspects of the current impasse to notice. First, in contrast to pre-1998 crises this is a political problem rather than a security problem. Time was when a crisis blew up and unionists danced up and down, extra troops were flown in and there was what the NIO called ‘a security clampdown’. This current problem will be solved by the parties talking whether the unionists like it or not. Secondly and more important is the way the British government has handled the impasse. It’s very instructive. They did not give in to unionist amateur dramatics, ultimatums, hissy fits or walk outs. Robinson likes nothing better than strutting into the hall in Stormont in front of the staircase and using it like a stage as he tries to make a drama out of a crisis. He has a special solemn voice for such occasions when for too long he has been able to get his own way. This time he and his bete noire, the political apprentice Nesbitt, got nothing, zilch, nada, unless you count a salutary lesson in political power. Big mistake confronting Cameron with threats to bring down the assembly if the British government didn’t suspend it to cover Robinson’s embarrassment at being upstaged by mighty mouse Nesbitt. Cameron rebuffed him and ignored his ultimatum. Robinson then tried to reduce the institutions to such chaos that the British government would step in. 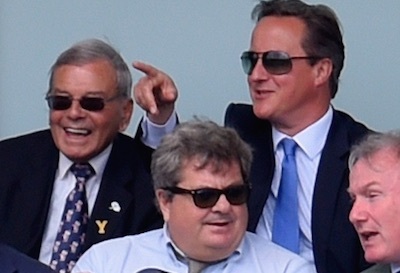 Cameron was pictured watching cricket at Headingley in Yorkshire. The message from London was, get into talks. No, not unless the existence of the IRA is first item on the agenda unionists said. Dear, dear trying to dictate again. Old habits die hard. By the end of last week Robinson was begging for a fig leaf to allow him to enter talks. Eventually our proconsul, note, not Cameron, provided it in the form of her panel to assess ‘all paramilitary activity’ not only wildly overblown stuff about the IRA. Journalists immediately asked what was the point of the assessment since the PSNI, NCA and MI5 must know already? Answer: to provide cover however meaningless for unionists. The unionist stance is even more incredible because the panel of three wise men won’t report until the middle of October when the talks are due to end and the Stormont budget runs out. So much for solving ‘the problem of the IRA’ before anything else. Unionists wanted a monitoring group to operate continuously but the Irish government vetoed that, Charlie Flanagan saying it was a ‘once-off’. They got nothing. Ironically a fund, tiny as it might be, to help deal with paramilitary criminality will only affect the unionist parties’ mates, the men they share platforms with, the ‘community leaders’. Surely after all this publicity the PSNI will at least have to make a gesture about the UVF and UDA whom they regularly accuse of gangsterism? Developing a strategy to deal with loyalist gangsters is obviously out of the question. Can you remember the leader of the UVF in Belfast, a household name, ever being arrested? Any houses of UDA leaders - household names - ever searched? That would be going too far. After the report of the panel the unionists asked for it’s going to be impossible even for the PSNI to ignore loyalist criminality. So if the British government’s response to the unionist manufactured crisis is instructive what have we learned? First, Robinson carries no clout at Westminster despite his eight MPs. The Irish government, a potential ally in Cameron’s renegotiation of terms with the EU, is far too important to alienate over a piddling problem unionists here invented. Second, Robinson desperately doesn’t want an election. The British know that now for sure. It’s not just his ill health and the fact he won’t stand again for the assembly or that many of his MLAs are briefing selected journalists against him. It’s the fear that if the UUP win a couple of seats from fundamentalist flat-earthers as Danny Kinahan did in May and the UUP convinces voters they dislike sharing power even more than the DUP, then Sinn Fein become the largest party at Stormont. Thanks to the genius negotiating of the DUP at St Andrews, Martin McGuinness then becomes First Minister. Then the assembly collapses because unionists won’t accept him.